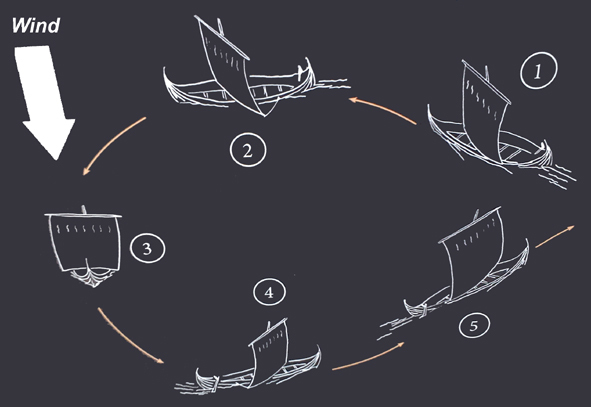 The form and shape of the square sail and rigging of the Viking ships were determined by the ship's type and by the size of the hull. The square sail was made of wool or flax. The boltrope made of horsehair and raffia was used to strengthen its edges. The sail was impregnated with a mixture of animal fat, ochre and tar, for it had to be wind-tight and waterproof. It was fastened to a horizontal yard that could be raised, lowered and swung in all directions depending on the wind. Two main techniques are used to sail with a square sail: tacking and wearing. The backed sail turns the boat until the wind blows on the other bow. Then the sail is quickly swung around and the wind is propelling the boat forward again. The turn radius needed for tacking is small. 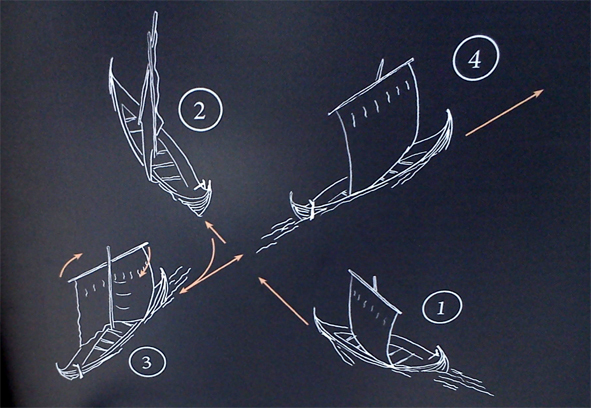 However, this technique can only be used in good weather because of the risk of capsizing when backing the sail. For small boats it is also common to lower the sail and turn with oars. It means that during the maneuver the full strength of the wind is filling the sail. The turn radius needed is wider than for tacking, but as far as wearing is safer, it is preferred when the weather is bad.